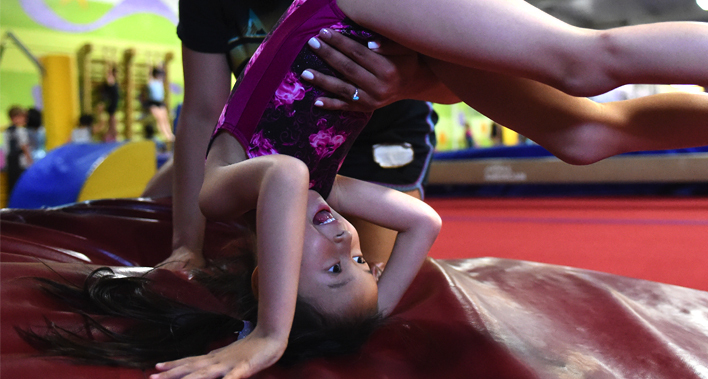 Gymnastics classes are the heart of Gold Star, taught by coaches who are enthusiastic, dedicated to student advancement, and committed to safety. We offer classes for both the recreational gymnast and the competitive athletes, for students just learning to walk through teens and adults. Our gymnastics classes are taught with a structured curriculum, a passion for the sport, and care of the children present in all our Gold Star programs. Student’s progress is documented during Star Weeks, five times a year. Star Week is designed to provide both feedback and motivation as students move through the program. Preschool students are given a ribbon indicating their level. Recreational gymnasts are given a poster corresponding to their class level. Students earn sticker stars for the skills they have mastered. Stars can then be put next to the appropriate skills on the poster at home. Preschool classes are based in real gymnastics skills presented in an upbeat and engaging fashion. We work to balance repetition and novelty to help children both feel safe and stay excited about coming to gymnastics each week. The class is structured for toddlers (with their parent’s assistance), and focuses on both gross motor and socialization skills. Students start lessons with a warm-up using manipulative props and end with a game incorporating music and dancing. In between are exercises on the gymnastics equipment: bars, beams, trampolines, springboards, and a multitude of mats. Children learn to jump, balance, and roll while practicing taking turns and following a circuit. Call for a free trial. In our MiniStars program, children participate independently (without their parents). The curriculum is presented through games and imagery; skills are practiced on obstacle courses comprised of traditional gymnastics equipment. Students start class with a warm-up using manipulative props and end with a game incorporating music and dancing. Students progress through three levels of instruction, mastering basic gross motor movements to more advanced gymnastics techniques. Call for a free trial. These classes are committed to safety, teaching true gymnastics skills, all while maintaining the excitement of rolling and cartwheeling through space. School-age students are separated by gender and ability (except for our Teen and Adult classes which are co-ed and multi-level). These boys gymnastics classes are divided into two levels: Beginner (Red) and Intermediate (Purple). Red classes meet for 55 minutes, and Purple classes for 85 minutes. Instruction is given on Vault, High Bar, Parallel Bars, Pommel Horse, Rings, Floor Exercise, Tumbl Trak, and Trampoline. Call for a free trial. These girls gymnastics classes are divided into four levels: Beginner (Red) and Advanced Beginner (Orange), Intermediate (Yellow) and Advanced Intermediate (Green). Red and Orange classes meet for 55 minutes, Yellow and Green classes for 85 minutes. Instruction is given on Vault, Bars, Beam, Floor Exercise, Tumbl Trak, and Trampoline. Call for a free trial. 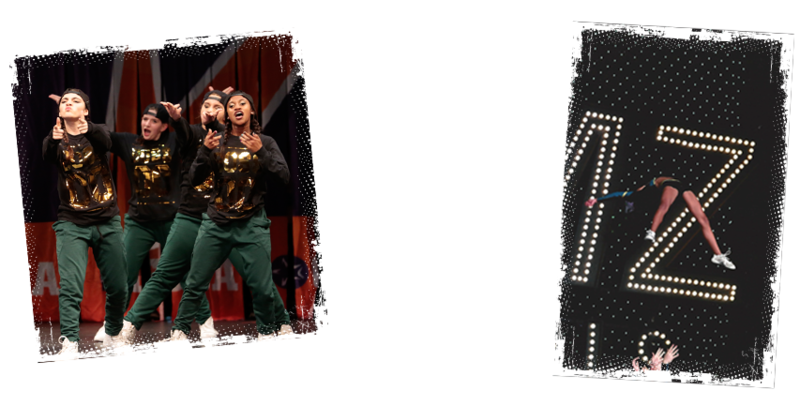 This co-ed class is multi-level, providing teen participants a socially appropriate environment to practice their skills. The curriculum addresses both the basic instructional needs of beginner students working alongside the demands of high level athletes. This class combines flexibility and strength training with instruction on Vault, Bars, Beam, Floor, Tumbl Trak, and Trampoline. Call for a free trial. This co-ed class is multi-level, providing adult participants a socially appropriate environment to practice their skills. The curriculum addresses both the basic instructional needs of beginner students working alongside the demands of high level athletes. This class combines flexibility and strength training with instruction on in both tumbling and on the apparatus. The class structure is a combination of instructor-led exercises and personal exploration on the gymnastics equipment. Call for a free trial.